Margaret F. LIVINGSTONE b. 188723 m. d.
Allan J. LIVINGSTONE b. 189737 m. d.
On her release from Maitland on 21 May 1871,48 Annie was returned to the Newcastle institution and within days was transferred with the school to Biloela. Annie continued to be a difficult inmate on the island as, in his report on 9 October 1871, LUCAS reported that she and Sarah BOURKE had been confined to the quadrangle for three days between 5 and 8 October for going beyond the enclosure.49 On 20 November 1871,50 Annie was discharged from Biloela to J. AARONS, Esq., of Wellington, for two years at a rate of two shillings for the first year and three shillings for the second year.51 Annie's apprenticeship would have concluded in late 1873 and no absolute confirmation of her after this date has been located. No further details of Annie's apprenticeship have been identified and it is expected that none will be located as this discharge was arranged by LUCAS whose paperwork has either not survived, was never sent to the Colonial Secretary or was never created. This apprenticeship is also unusual in that other superintendents found positions for girls close to their families and most usually the girl was returned to an area near her arrest and evidence has been found for the reasoning of the superintendent behind any exception to this rule. An inland apprenticeship was therefore unusual for Annie as she had been arrested in Sydney and her family was located in Camden Park. This location was also some distance from the north coast where it is believed that Annie eventually resided although it is not so distant from Camden Park where her father was almost certainly working at this time. 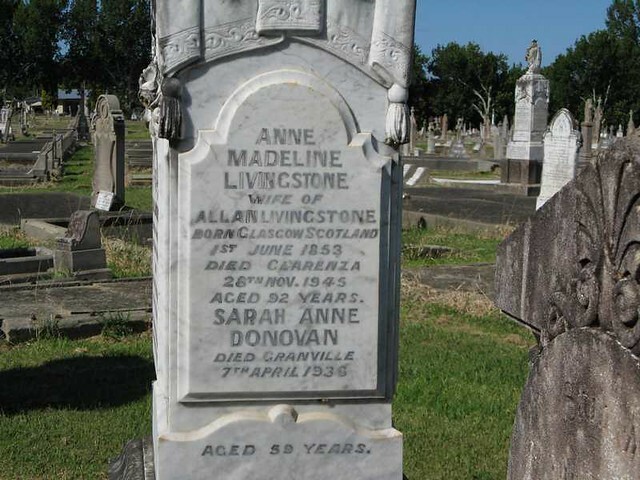 It is unknown whether the Annie Madeline ELDER who married on the north coast of NSW was the unnamed female infant who arrived with her parents and who had been born on the voyage or, because of differences in the age and the use of the given name, Madeline, she was the older, identified sister whose age was understated when she entered the Newcastle school. At the time of her arrest, Annie's father was identified, by the man reported to be his son, as a tenant farmer on Sir William MACARTHUR's estate at Camden Park.56 He was not named. While no mention of Camden Park was made in the obituary of the man believed to be Annie's father, there is little doubt that Annie's correct family has been identified although this hasn't been confirmed and some inconsistencies exist. It is unknown whether Annie was the older child known as and recorded on the indent as Madeline, but who was possibly baptised in Scotland as Annie Madeline, or the second daughter who had been born aboard the Exodus whose name was Annie. One of these two girls eventually married Allan LIVINGSTONE. The question must be asked whether this unnamed female child be the other duaghetr of the family, Margaret, whose birth hasn't been identified. It is still possible that there was another family who have not been found. Ann's arrest in Sydney very strongly suggested that at some stage between 1862 and 1870, all or some of her family moved from Raymond Terrace to farm at Camden before moving to the north coast by the 1880s. William and Anne ELDER had arrived aboard the Exodus in Sydney in July 1855 with their daughters, Madeline and an unidentified baby girl born on the voyage.57 The indents identified that the family was both Church of Scotland and Presbyterian. No son named Alexander was identified arriving with them but Ann's brother, Alexander, was identified as her relation in the colony. Baptisms of two children were recorded in the Presbyterian register in the Hinton area of the Hunter Valley and while no names were recorded in the church register, matches can be made with the appropriate registrations on the NSW BDM Index made in the nearby settlement of Raymond Terrace. Catherine ELDER, had been born on 5 January 1858, and William ELDER on 24 January 1860. Both these children were baptized on 25 March 1860, by Reverend BLAIN and at this time William was described as a farmer on Eskdale, Port Ree. A further daughter, Alexandrina, was also registered in Raymond Terrace in 1862. A further unregistered daughter, Margaret, has been identified through newspaper articles. An Alexander FRASER, the son of Donald FRASER from Inverness and born in 1803, arrived in 1839 aboard the Lady McNaughton. He was a farm overseer. Another man arrived from Elgin, Moryashire, and he was accompanied by a Matthew FRASER from Inverness. It is unknown whether the two were brothers or just alphabetically listed on the St Vincent indent in 1851. Another man from Inverness and born in about 1824, arrived on the St Helena in 1854. A shoemaker named Alexander ELDER who had been born in about 1824, arrived in Melbourne in 1852 but it is considered unlikely that this man was Margaret's brother as it is believed that he should have had the surname FRASER or FRAZER.